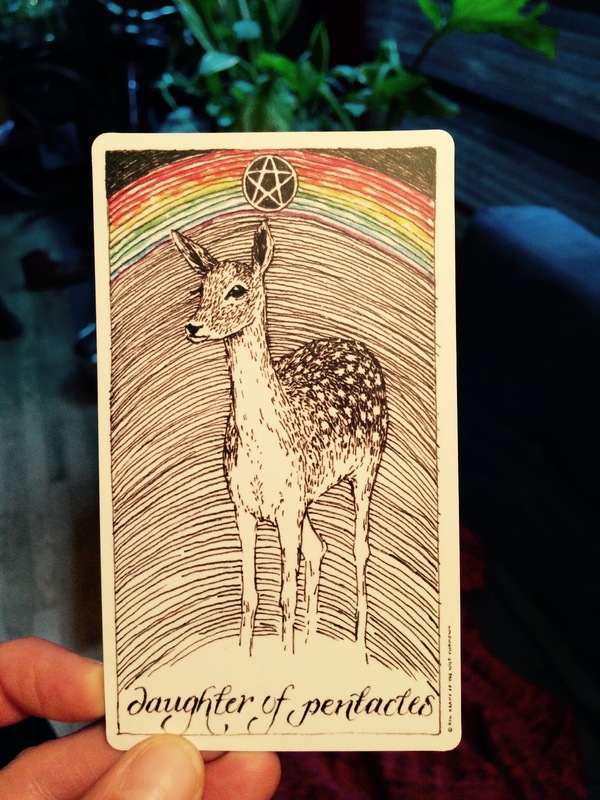 in more traditional decks, the pentacles are often represented as coins and as such are inclusive of all the material…including money which can be…touchy. tricky. 1. are our feelings regarding our bodies in alignment with our embodiment? 2. are our embodiment practices in alignment with our worldly lives? 3. are our worldly lives in alignment with the world? we can inquire deeply into our own conditioning, for example, is how i view my body tempered by a story that undermines its Special Given nature? do i reach and yearn for things that i know will confirm my existence? the deep work in the context of now is to subvert the story that tells us we need all those things (the phone, the car, the clothes, the shoes, the body, etc) to be better: to exist. that who we are, what we embody, isn’t Special Given but is rather a result of gene strands and random biology. this is actually the very same story that tells us the earth is an object, that water isn’t precious, and that trees can be bought and sold. these practices can be radical and anarchistic, but they can also be more things we reach for and cling to…but the brilliance inherent in the practice is that in that case it won’t last. we can spend a given amount of time floating around on the surface, face-up to the sun, but eventually that low-level-drone-like-rumble of the fear of the sharks swimming just beneath us will frighten us out of the ocean. but i think the practice wants us to understand that not only are we in fact the entire sea on whose surface we may be resting, we are also the sharks! the radical, anarchistic nature of these practices is the subversion of the old story by embodying the telling of this one: none of us is inherently separate from anyone or anything; every day we’re collaborating on the world we wake up to and inhabit; we actually want a more understanding and compassionate world. the message in-a-nutshell of this card? you, or someone close to you, has come into a new or different understanding of the pleasures inherent in embodiment and living in the world of sentience and objects OR is ushering forth an ancient understanding recontextualized in alignment with now. either way, inquire.